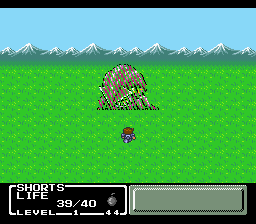 And there's a spite that looks a lot like the sickleable plants in Seiken Densetsu. I'm really hoping someone else will do the comparison sidebar and save me the trouble. 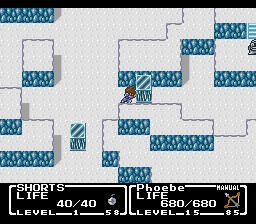 I'm not actually very familiar with FFL3. 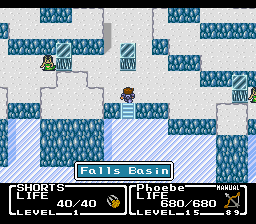 I'm not actually very familiar with FFL3.
! This is a fixable problem! It's the same team for Saga/FFL 3 and MQ, yeah. I'm not sure if they worked on the first two SaGa games, I think that was Kawazu's own team for those. The sort of harpy-tengu-like creatures in this game always looked like they were wearing diapers to me. 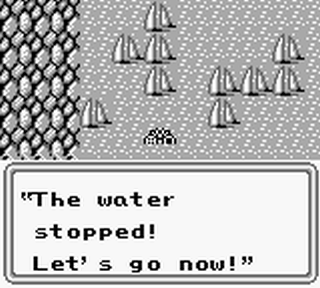 Yes, but I already played FFMQ to near-completion just so I could start this LP. 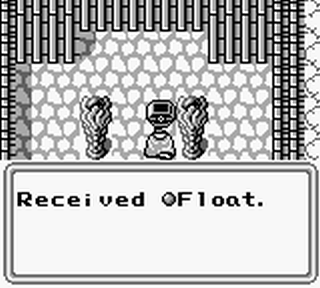 I'm not going to play through a mostly-unrelated game just so I can add footnotes. I love the monster design in this game. They're all so fun and the "damaged" sprites are even better. 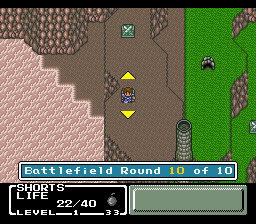 I mean, I specifically avoided pointing out the FFL/SaGa III graphics comparisons because it's like the entire game. Even if it wasn't the same full team doing the art the little bits and pieces that are very close to earlier games is interesting to me, though. 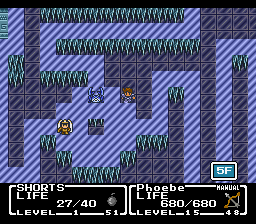 I have a database of FFL3 images all set to go, from that time I did an LP of it. 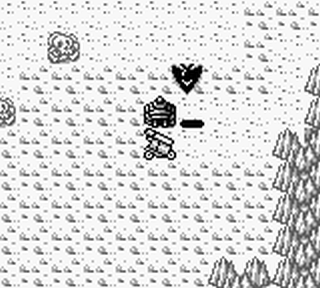 The tilesets definitely match, if in color and upscaled. I find it really disconcerting that its Flamerus and not Flameosaurus. 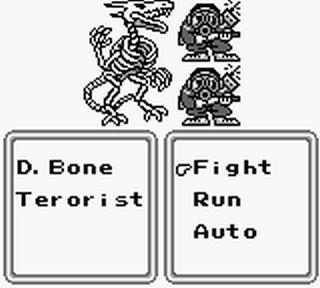 Actually, since it's a skeleton and has no fire-based attacks, it was more likely intended to be Framesaurus. Sorry if this is late, but I just wanted to put my two gil in. How does that make more sense?? Oh, you already answered. Never mind. 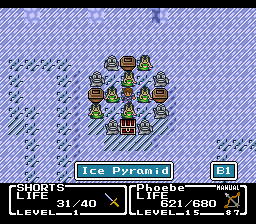 To reach the Ice Pyramid, we must first cross the Falls Basin. 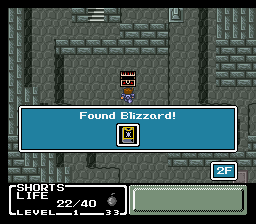 This is in the running for shortest dungeon in the game. 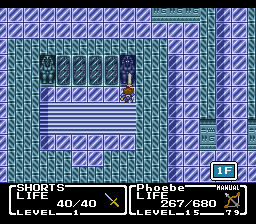 Phoebe, unacquainted with "walking around it," suggests pushing the pillar out of our way. This is our indication that we'll be dealing with a block-pushing puzzle. 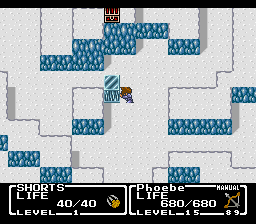 The pillar is also a platform, and since we can jump over one-tile gaps, this makes for a fun mix of puzzle and pseudo-platforming. 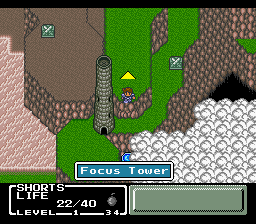 If this were Golden Sun, this would be approximately half of the game, but in FFMQ, we'll only see a solitary pillar outside of this dungeon. 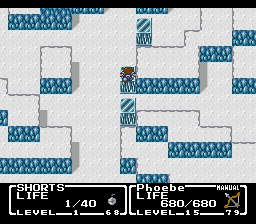 You can't push the pillars so that the lower half would be behind raised terrain. You absolutely can shove them into a corner and make them irretrievable, so don't do that. 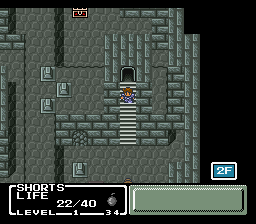 The pillars' locations reset if you leave the dungeon, for better or worse. Our first pillar is in place, and we get a sneak peek at the boss. 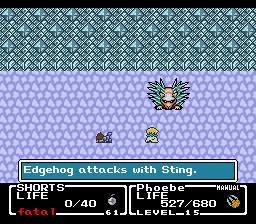 If you've played FFMQ, you'll probably remember that the Hag family of enemies counterattacks. 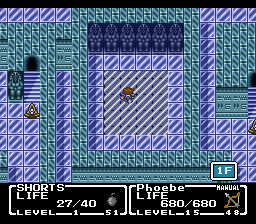 Even in a normal game, SHORTS isn't strong enough to take out one of them in a single hit. It's not even worth attacking in our case. 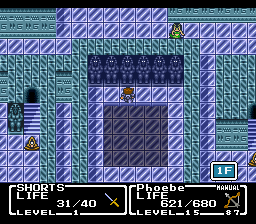 Set up the pillars like so, and you can skip a good bit of this already-short dungeon. 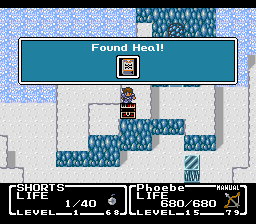 The chest just before the boss contains Heal, which is handy given that SHORTS will often find himself on medic duty. Our boss is Snow Crab plus two Desert Hags. 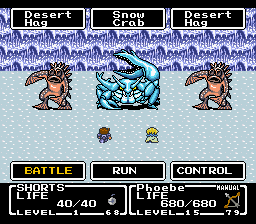 The Hags are weak to Fire, but Snow Crab takes almost no damage from it. Once the Hags are down, Thunder is again the order of the day. 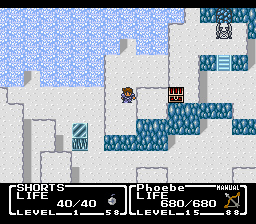 Snow Crab is weak to the axe, which is fine in a normal run, but in our case, SHORTS is better served tossing bombs or keeping Phoebe topped off. And you really should keep Phoebe topped off, because this can happen. A confused hero will use a random action on a random target. 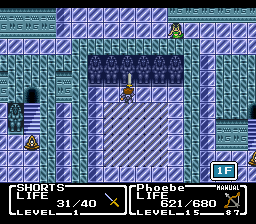 If SHORTS ends up confused, no problem -- just make sure to switch to the sword. 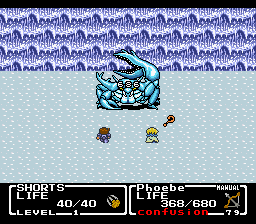 In this case, though, Phoebe opted to use a regular attack against Snow Crab, which landed a critical hit. This is even better than Thunder! Confusion is the only real threat in this battle. 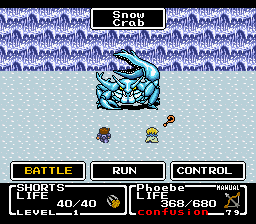 Snow Crab once again has no multitarget attacks, so you might opt to let SHORTS sit this one out, but the safest way through this battle is to have SHORTS constantly administer Heal (in either spell or potion form) to Phoebe to pre-empt confusion. 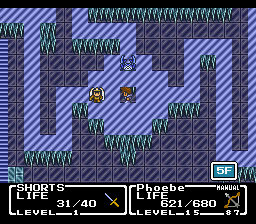 Otherwise, you can expect a loss or two as Phoebe fills herself with arrows. 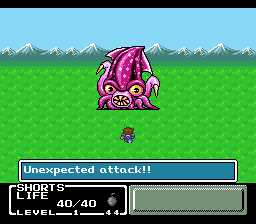 Unlike other Final Fantasy games, confusion doesn't end in FFMQ when the character takes an attack, so it's a likely game over. Luckily, we only lost once that way. 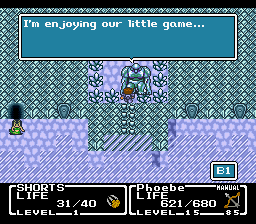 After beating Snow Crab, Phoebe teaches SHORTS the secrets of Jumbo Bomb. You're not missing anything between these screengrabs. I like to think that the explanation was, "Throw bigger bombs." With this upgrade, SHORTS is back in business. Jumbo Bomb has 112 attack power to Bomb's 63. 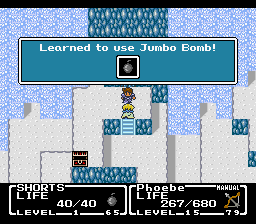 As before, you'll want to use Jumbo Bomb on lone targets, but when we can set that up, SHORTS will be pulling his weight again. Outside of battle, the Jumbo Bomb isn't able to destroy anything a regular bomb couldn't. 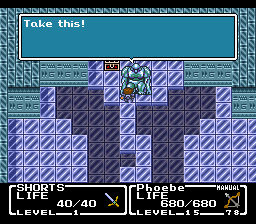 Out-of-battle weapon upgrades do exist in this game, though! 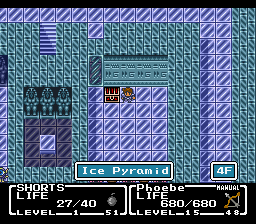 We've reached the summit: Ice Pyramid. Sadly, there's no way to proceed. 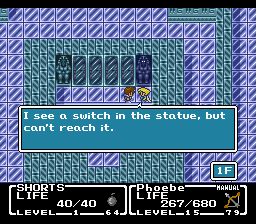 Phoebe sees a switch, though, and that gives SHORTS an idea. Hopefully, that gives you, the player, an idea, too! 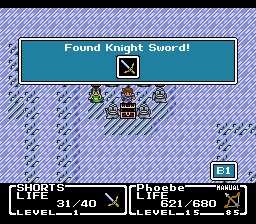 At this point, we have every kind of weapon in the game, and it shouldn't take you long to cycle through them and find that it's the sword that works. 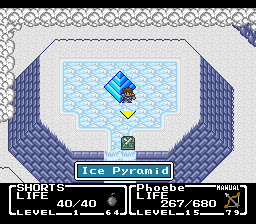 The sword is almost never helpful out of battle, but it gets its moment in the spotlight here in the Ice Pyramid. Any statues that are darker and have glowing eyes like this one contain switches. 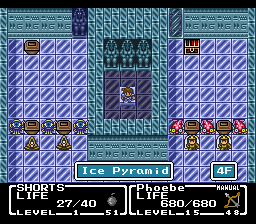 The Ice Pyramid's gimmick is that the monsters are invisible. Didn't we get a clue about seeing monsters? Yes, that's right: we can see the monsters with the help of this mirror. 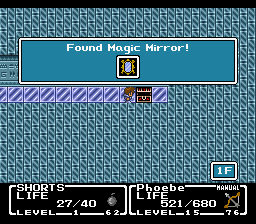 The girl's hint lets you know that the mirror exists, but it doesn't actually help you find it. 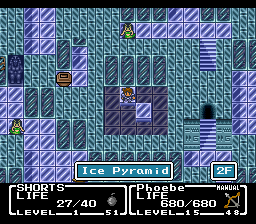 The mirror is very close to the entrance of the Ice Pyramid, but it's not near the critical path, so I almost always forget to get it. 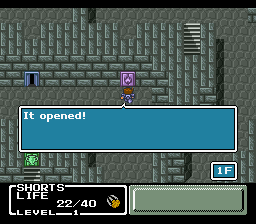 Hint: the monsters are always at the chokepoints, and the Magic Mirror is not at all essential to this dungeon. Here, we find the fourth and final type of consumable: the Refresher. I see you guys calling my bluff on the Seeds; Refreshers are actually completely useless, though. The intent is that they restore lost stats, but those reset after battle and never have an appreciable effect anyway. 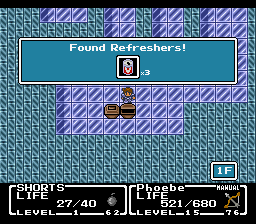 Unlike the other consumables, you can't use Refreshers outside of battle even if you wanted a refreshing drink. 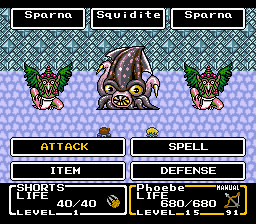 Squidite gets a palette swap in the Phanquid. This isn't even the first boss that's been palette-swapped -- the Minotaur became the Minotaur Zombie way back in the Bone Dungeon -- but it's starting here that the game starts aggressively reusing any boss that's not one of the crystal guardians. 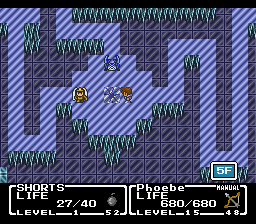 This battle is also notable because Phoebe can't kill either of these enemies with one attack. 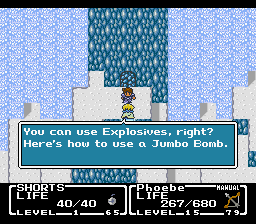 Magic still works, though, and either enemy dies to a focused Jumbo Bomb. And these chumps are notable because they're actually weak to Bomb. A single attack will wipe out a pair of them. This is a good time to point out that there is a Defend command in FFMQ. Why does that matter? Because you can target an ally with Defend. 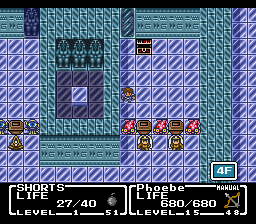 If Phoebe uses Defend on SHORTS, then SHORTS will survive to toss a Jumbo Bomb. This is useful starting right about now, and not for the last time. Also starting now: petrification! 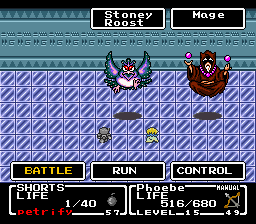 The aptly-named Stoney Roost can petrify a character. 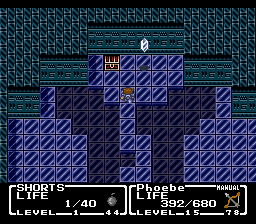 If it's SHORTS, then it's no worry, but a petrified Phoebe is a quick game over. 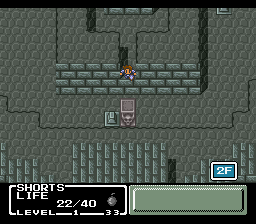 This might be the only instance where you need to jump over a chest? 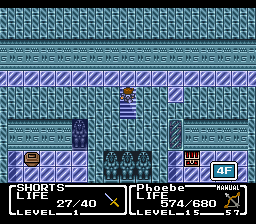 On entering the fourth floor, we see a chest we can't reach. This is an important one; we'll get back to it. The fifth floor is all catwalks, no rails. One wrong step sends you back a floor. But maybe we want to go back a floor! This odd-looking tile is begging for a bomb. 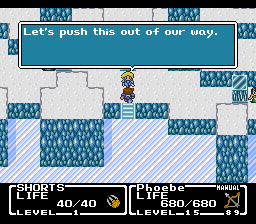 Before we jump down that hole, though, let's walk off the top of this platform and land right next to the chest, hmm? Aww yeah. That's the stuff. 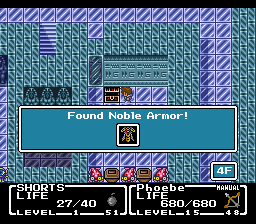 The Noble Armor is so good that the any% speedrun goes out of its way to get it. 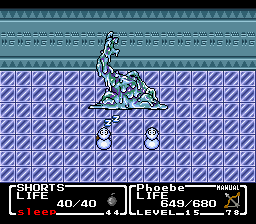 That's mostly because it resists ice, but the extra 6 Defense and Evasion don't hurt, nor the poison immunity. But it still says a lot that the speedrun grabs it, because there's a minimum of two battles and a long walk required to get it. Anyway! We have a hole to fall down. We're trapped in a room of dark statues with glowing eyes. You know the drill. We're deposited into a horde of monsters. This is really frustrating if you didn't grab the mirror. 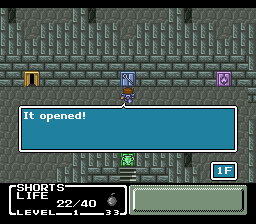 The chest contains a sword upgrade. This is decent enough, even in our hands, since we get +5 Speed when we're holding it. We won't ever swing the sword, but we'll want this in our hands when we need every last bit of turn advantage we can get. 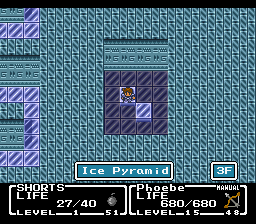 The boss of the Ice Pyramid is hanging out at the top of this room, but instead of fighting us, he acts like he knows us and disappears. The sarcophagi on the walls can be destroyed with a Bomb, but it doesn't do anything. A short climb later, we find the boss's actual lair. If you didn't talk to him below, he's still waiting here. It's odd that he shows up to taunt you down there. 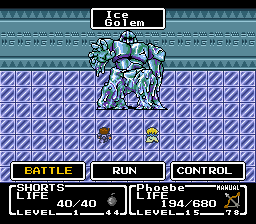 Naturally, Ice Golem is weak to Fire. He takes around 600 damage from Phoebe's Fire, but Jumbo Bomb is no slouch either, dealing about 400 damage. 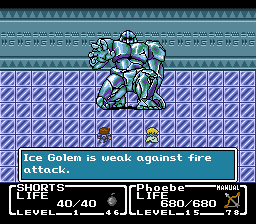 Two rounds of Fire + Jumbo Bomb is enough to start Ice Golem melting, although things will only get harder at this point, since we've been ignoring his attacks. 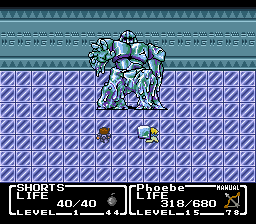 Like Flamerus Rex and his rib, Ice Golem gets a projectile in the form of this ice block. Both heroes resist it, but it still deals around 150 damage. Ice Golem don't fool around. Except when he does: he can sing at you and put you to sleep. 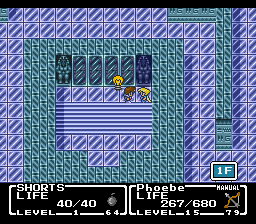 Phoebe is immune, and for SHORTS, it's no worse than being dead. 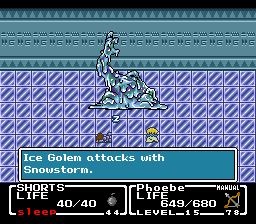 Sleep doesn't stack; sometimes, Ice Golem just gives you a break. Aha, here's his trump card. Snowstorm takes a neat chunk off both characters and heals Ice Golem to boot. This can cause him to revert to a less-melted appearance. This is where the battle starts getting hard. 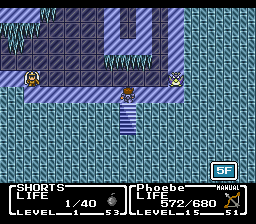 Around this point in the battle, he really starts spamming Snowstorm, and when SHORTS is down, Phoebe takes double damage from the attack. This doesn't leave you a lot of breathing room, and a Snowstorm followed by a critical hit is enough to drop Phoebe. 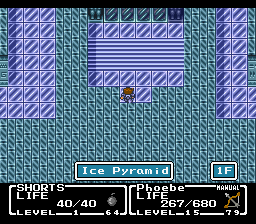 Even worse, Phoebe isn't consistently faster than Ice Golem. This easily leads to you losing the battle due to bad timing. Whether or not you choose to keep SHORTS on life support, you get into a lot of long stretches where you can't deal any damage. SHORTS is nice to have around, both for Jumbo Bomb and for Cure support. 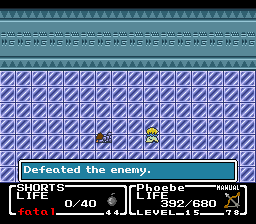 When Phoebe is around half health, targeting Phoebe with Cure while Phoebe casts Fire is good insurance: if Phoebe takes a hit, SHORTS takes care of it, and if not, then Phoebe gets off a clean hit. Snowstorm throws a wrench into this. You need things to line up for you in order to win this, but we only lost once, which is better than we did against Flamerus Rex. SPOILERS: We are not going to do that. The game really wants you to talk to Spencer at this point, but it's optional. 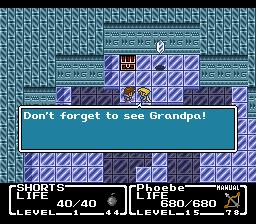 I don't even remember what happens in that cutscene. 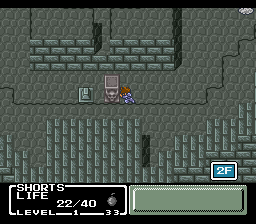 SPOILERS: You are in deep trouble if you forget to open this chest. 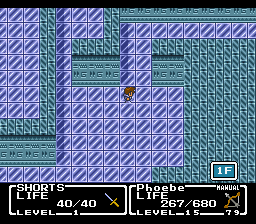 Phoebe is gone, and we have the key to the next door in Focus Tower. We're in for some exciting new adventures next time. Please look forward to it! 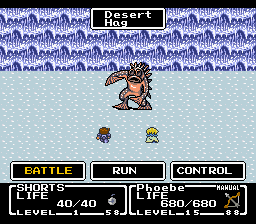 "Hag" is an interesting title for an enemy that looks like a spiny Gillman. My guess is, it's a shortening of Sahagin, the D&D creatures that appeared in FF games as early as the first ones. 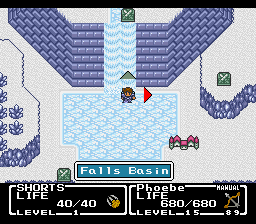 Falls Basin was where my childhood playthrough died. I don't know how I wasn't able to figure out the easy block puzzle that's the area's primary challenge - it's possible I pushed a column into a corner and couldn't figure out how to reset them. 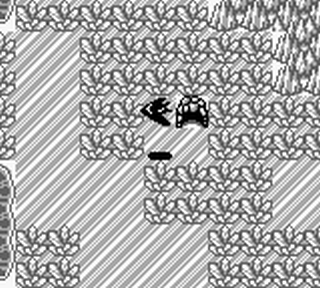 This is probably one of my favorite enemy-damaged sprites in the game. 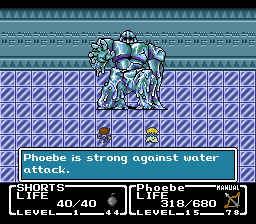 I can just imagine SHORTS and Phoebe having an exchange with the Ice Golem not unlike the Black Knight from Monty Python. That, friends, is the good stuff. If the Resistance Bug was mindblowing, you'd better buckle up, because you ain't seen nothing yet. We are going wild places in this LP. So far, we've showcased several major glitches. The biggest glitch of them all is coming in our next chapter. We'll get there when we get there, but until then, what about the other glitches? FFMQ is no FF6, but it's still got its share of problems. 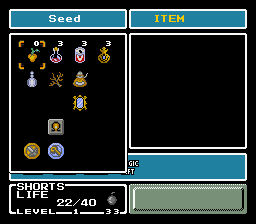 The Life spell is instant death against any non-undead enemy. This glitch feels more like a feature than a bug, and if it hadn't been for the Japanese and European releases fixing it, it would be arguable whether it was a glitch to begin with. 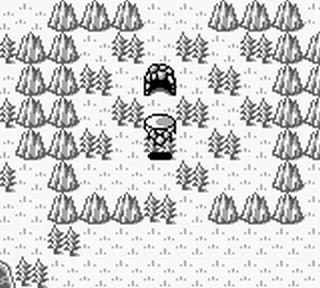 We used this against the first real boss of the game, but never since. The Resistance Glitch allowed us to take an existing save file and copy the partner's resistances onto our game on a semi-permanent basis. Partner equipment is only updated when you load a saved game, so if you boot up the cart, start a new game, and play through it without stopping, none of your partners will ever have any resistances. The Item Duplication Glitch gave us an infinite supply of Seeds. 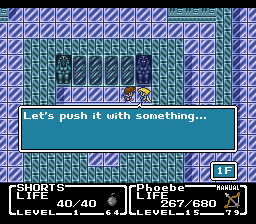 To pull this one off, make sure your partner is set to Manual, then command SHORTS use an item and run away instead of giving your partner a command. What do all these glitches add up to? Well, Item Duplication makes it so we don't have to run in and out of Bone Dungeon a few times, and the Resistance Glitch has kept our partner from being paralyzed now and then, but the sum total of these bugs has been less than totally game-changing. Next time, we will change the game. Please look forward to it. Wait. The sprite for the Refresher is supposed to be a soda can? How did I never realize this before? I couldn't tell you what I actually thought it was, but I'm reasonably Kid Dracula didn't see a soda can in that sprite. 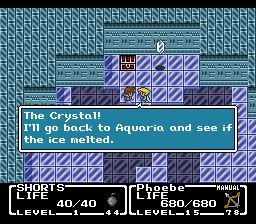 We immediately see the effect of freeing the Water Crystal. 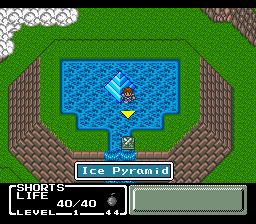 There's still an Ice Pyramid at the top of the falls for some reason, but everything else is thawed. 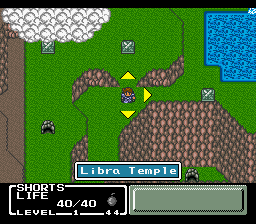 For the first time, we can go north from Libra Temple. This gives us access to a very special Battlefield. Curiously, you can get ambushed in Battlefields but nowhere else. 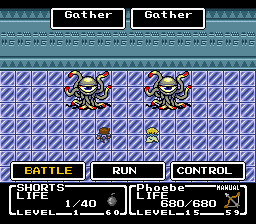 Like Squidite, Phanquid can use Electrapulse, the attack that deals single-digit damage and lowers our Magic, so we miraculously win anyway. 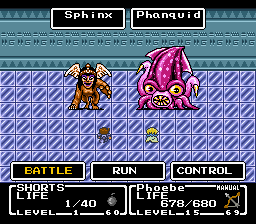 This Battlefield has two enemy formations: this one and one with a Phanquid and Sphinx. We can't beat the Sphinx formation, but we can win against a lone Phanquid, even though every battle in this Battlefield ambushes us. Phanquid always opens with Electrapulse, but the second round is dicier. 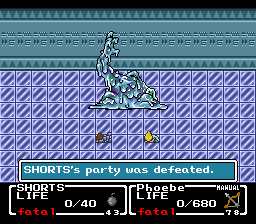 At this point, a Battlefield SHORTS can clear solo is an aberration, so we do that for the novelty, even though it takes a dozen attempts per Phanquid on average. 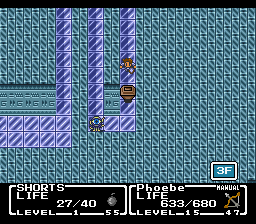 Our reward is Exit, the fourth and final White magic spell (although SHORTS hasn't learned Life). No partner learns Exit, so it behooves us to pick it up for ourselves. This is the only Battlefield the speedrun bothers clearing, and it's obvious why: Exit takes you out of a dungeon, avoiding the long walks. And if that were all, Exit would still be nice to grab, but there's more. 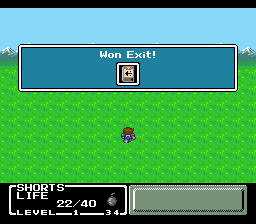 Exit removes any one non-boss enemy from battle with an excellent success rate. We don't get rewards for an enemy removed this way, but that really doesn't matter when we can't earn experience anyway. Further along this northern path is a rear entrance to Focus Tower. 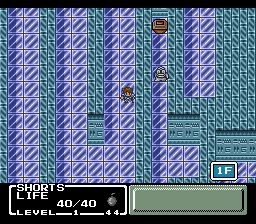 This takes us to an area we haven't seen before, where we find a treasure chest and Mysterious Cloud Jerk, which I can only barely fit onscreen at the same time if I take the grab as I'm walking. 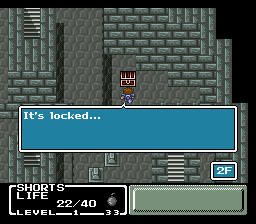 Alas, the chest is locked. We'll keep it in mind should we come into possession of a key. If you've been keeping up, you'll know that I ignored Mysterious Cloud Jerk. I didn't ignore the pillar next to him. We'll push it over here to form a bridge for the upper path. Further to the left is a chest containing Blizzard, another spell we won't ever cast because we don't have the stats to make use of it. For some reason, Blizzard appears second in the Black magic menu, although it's our third such spell and the strongest so far. ...to a rocky area beset by constant earthquakes. You can't see the earthquakes in these stills, so you'll have to take my word for it. We already freed the Earth Crystal, so these earthquakes are unexpected. 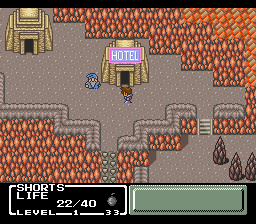 Our destination here is Fireburg, which has the most upscale lodging on the planet. Let's take a look. A man who is trapped behind a window offers to sell us Seeds. I think this is the only place in the game you can buy them. 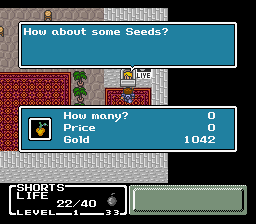 We don't need Seeds, so we buy zero Seeds. And now we have zero Seeds, just like we ordered. But -- this is odd. We can still use them. Let's try it. 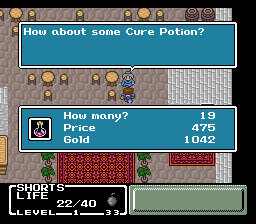 But now we have Sky Coins instead of Cure Potions, so we need to stock back up on Cure Potions. 19 should be enough. 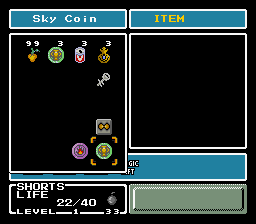 So hey did you notice that we have a key in our inventory now? I sure did! 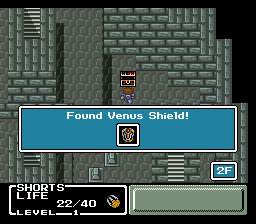 Now we can get the Venus Shield. Compared to our old Steel Shield, the Venus Shield offers an additional 5 Defense and 6 Evasion as well as immunity to Paralyze. Not a huge boost, but we'll take it. The immunity is real good. We also swapped our Sand Coin and River Coin for a Sun Coin and Sky Coin. 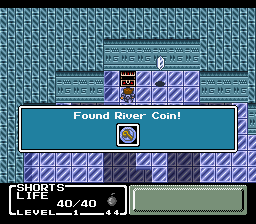 We can't reach the door matching the Sky Coin, so let's go this way. 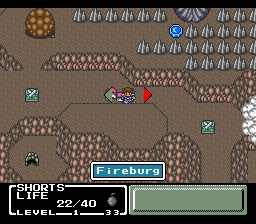 We can finish exploring Fireburg later. 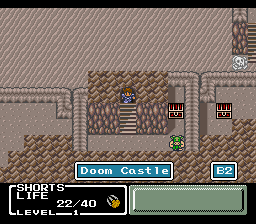 The stairs next to the door lead to Doom Castle, the game's final dungeon. We aren't equipped to solo an encounter in here, so we'll have to come back.